The end of the summer marks the beginning of Autumn, and it's crept up on us quicker than we can say boo to a goose. We remain inspired and geared up towards offering state of the art team building activities at this time of year. Despite the weather being, how do we say... British?! We're big believers in giving our clients what they want, when they want it, so take a look below for our Top 4 Indoor events for Autumn! 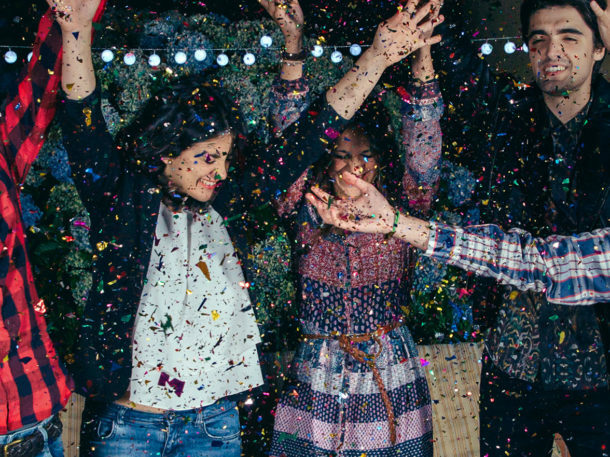 Without further a do – we take a look below at our Top 4 Team Building Events for Autumn! Dr Jonathan Black has been found murdered at Tudor Mansion. It is your team’s task to try and solve who really did kill him, where they did it, how they did it and what the motive was. Three possible suspects have been identified. With a forensic twist on the classic game, you and your team must prove who murdered Dr. Black! Professor Plum Smith a long-term acquaintance of Dr. Black. Details: This event is based on an investigation into who committed the crime. 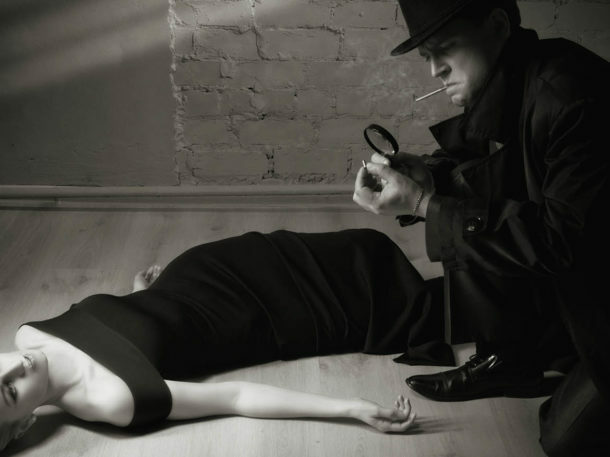 This will take each participant through the stages of forensic techniques which are adopted by real life crime scene investigators. 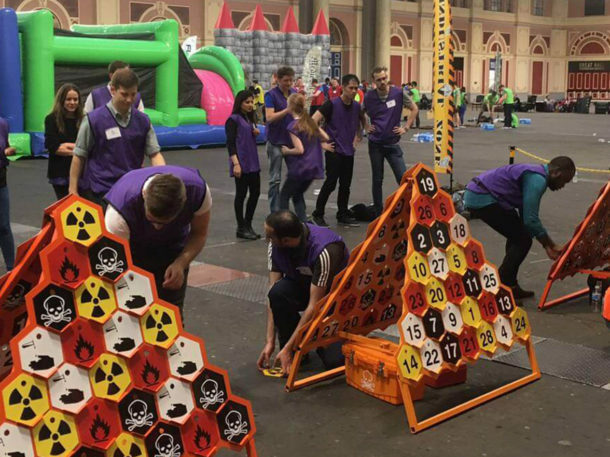 We know this event is fully immersive and engaging where team work, problem solving and communication are the key elements required to come out on top and be the winning team. This is why Real Life Clu’doo makes such a captivating team building event, as everyone is guaranteed to get involved. Last but not least, our Real Life Clu’doo event is, at large, a unique twist on the classic & traditional game, making it a perfectly familiar and conversant team building event no matter what industry you operate in. The CEO of Buckley Casinos has been found murdered in his casino and it’s down to you and your team to solve the investigation. 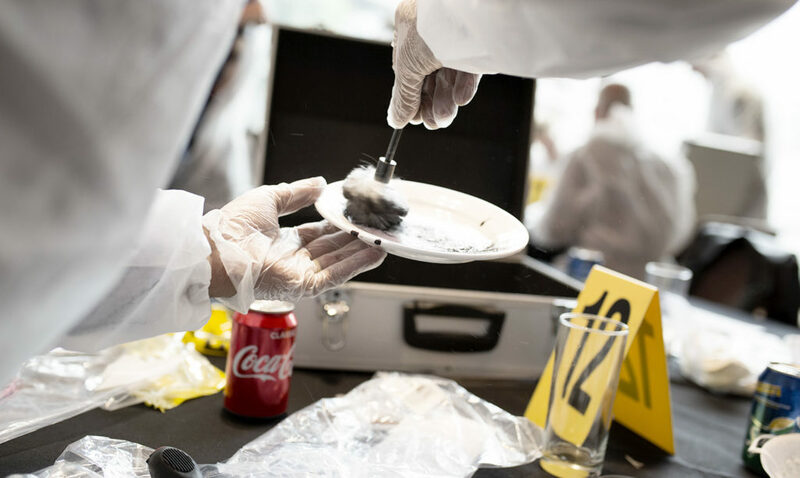 Our Crime & Dine team building event is a truly entertaining evening experience that takes place over dinner and will see all guests trying their hand at fingerprinting, hair and fibre analysis and other forensic activities. Details: This event is a whimsical addition to any corporate dining experience, and we’ve hosted an abundance of these over corporate dinner parties in the past – every time being a huge success with huge smiles and a ton of interaction. The whole event has been designed by ex-detectives and is based on a true historical case, enabling you to get closer to the action in a well-arranged, truly immersive environment. Each and every participant will leave this team building activity having learnt and mastered some extraordinary skill sets that you don’t otherwise get a chance to experience in many other scenarios. 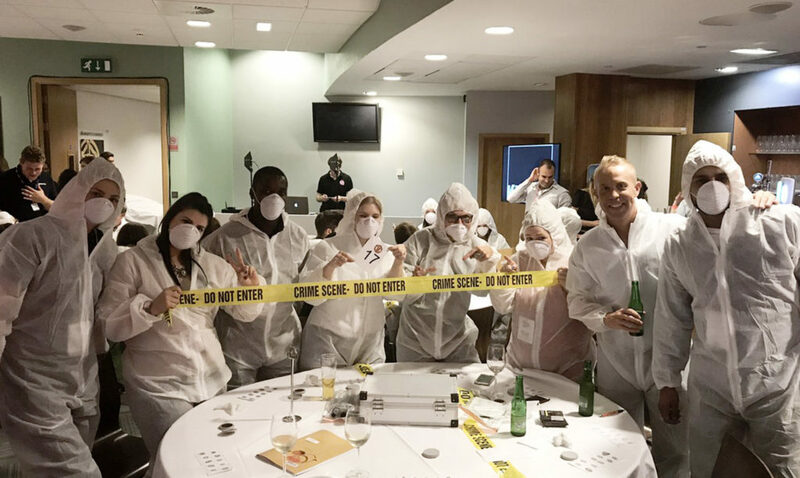 You will be tasked to collate evidence whilst your team is challenged to work together, solve clues and piece together evidence which solves the crime. If you were to take Celebrity Juice and mix it up with Master Mind and Never Mind the Buzzcocks then you would have one of our most exhilarating events: This is ‘Game On’. This game show mash up consists of team challenges, individual challenges and head to heads. An interactive and high energy addition which will create an unforgettable evening of entertainment. Details: As with most of our team building events, this event can be completely and entirely tailored to your company requirements in a bespoke fashion. We pride ourselves on flexibility and delivering the exact experience that you envision taking your team on. We call this team build a ‘one-of-a-kind’ as we’ve truly never found a team building activity out there which stands up against it. Best of all this is the type of event where everyone is assured to getting involved and taking part. With variety being the spice of life; this event will cover every base and fulfil the requirements for why you’re considering team building in the first place. There are a number of different interactive and entertaining challenges included to keep you and your team on your tip toes. Learn more about this event: Game On! This Cocktail Making mobile Team Building activity is not only ideal for promoting a fun and sociable team working atmosphere but challenges attendees to learn and perform new techniques and knowledge. 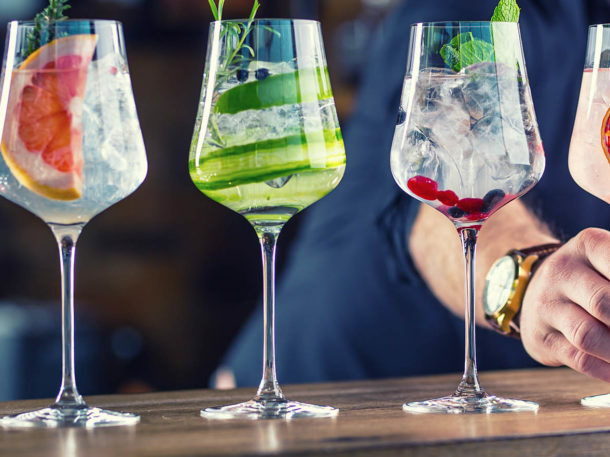 Our Cocktail Making team building event is a fun and engaging mixology masterclass where teams will learn a skill, use their creativity and overall boost their morale and bond with teammates. Everyone gets the chance to learn different methods of creating cocktails and to take part in a mystery cocktail making challenge to test their skills. Details: This event is light-hearted, friendly and all about people having a good time whilst connecting with one another. 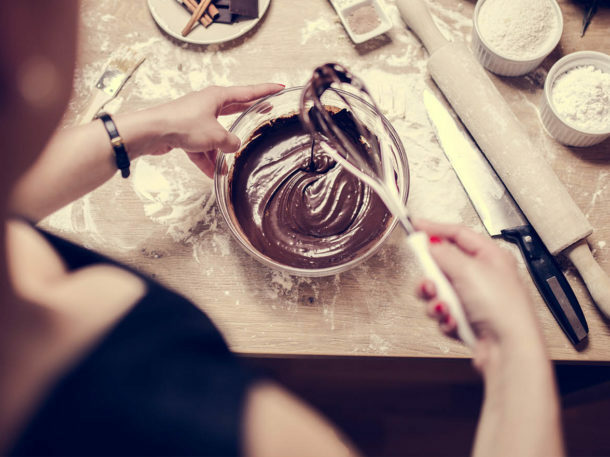 Cocktail Making is a guaranteed morale booster, helping you to reward your team for all of their contributions to your business and boost morale with this strictly sociable activity. Delivered by only the finest, enthusiastic and experienced mixologists – you’re guaranteed to pick up a couple of tricks and characteristics. Maybe even learn yourself a new party trick! Every time we’ve hosted a Cocktail Making team build, we’ve had such positive feedback. (Just have a quick scan through our Trust Pilot reviews if you need reassurance!) This is a fun, exciting and truly memorable experience which your team will be talking about for years to come. Above all, this event allows your team to get to know one another on a deeper level while appreciated one another’s strengths, differences and weaknesses. If you enjoyed reading this article, or maybe if the time of year isn’t right and you’re looking for Christmas activities, have a read of our articles Top 5 Christmas Team Building Activities, 10 Steps to Organising the Perfect Christmas Event & 3 Mistakes Not to Make as the Christmas Party Organiser.